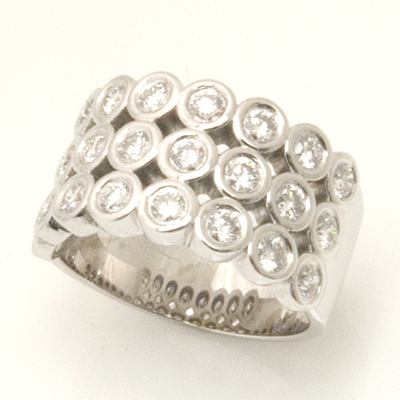 Platinum 24 Diamond Ring — Form Bespoke Jewellers Ltd. 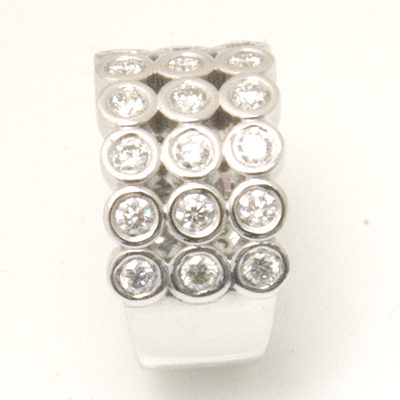 The customer came to us with an idea for a super-sparkling dress ring. Alongside our expert jewellers, a design was created for a platinum 24 diamond ring! 24 round brilliant cut diamonds with matching colour and clarity were chosen and then rub set by hand into a bespoke platinum setting. The choice to have rub set diamonds kept the design both contemporary and practical. The diamonds were also chosen to be set only across the top half of the band for added comfort. The ring was then hand finished and polished in our Chapel Allerton studio.